This incredible Pre World War II game worn hockey sweater is the earliest specimen in the Global Vintage collection. 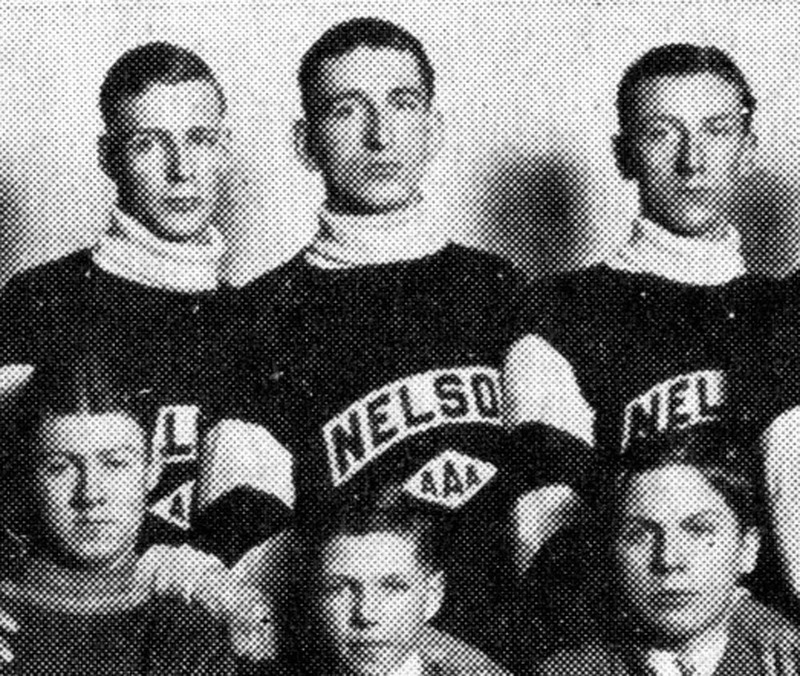 I believe this particular jersey is from the 1920’s Nelson, British Columbia Hockey Club and/or the Nelson Kokanees of the Western Kootenay Senior Hockey League. The high turtleneck sweater is indicative of the era. 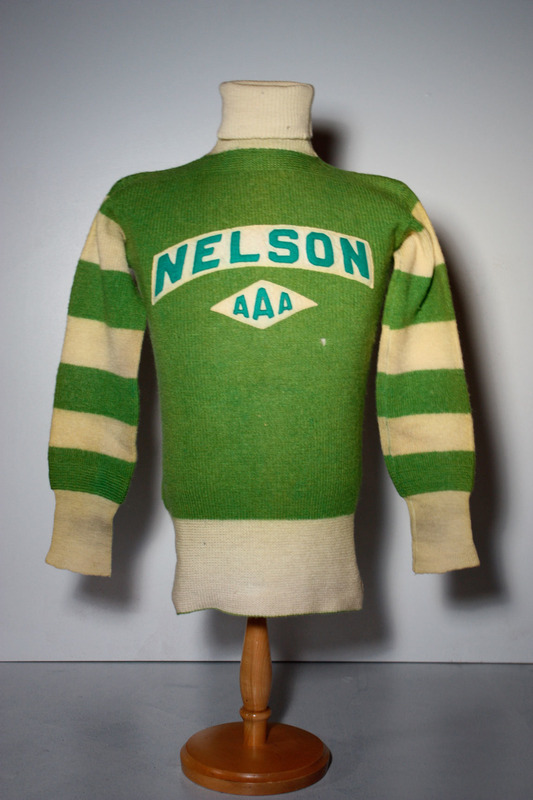 The jersey exhibits tremendous attention to detail in the form of individually sewn on felt cresting “Nelson” and “AAA”, “barber pole” striping on the arms, a fine single strand of green wool at the very base of the jersey and a “Universal - Canada’s Finest Guaranteed 100% Pure Wool” tagging in the neck line. The quality of this sweater is second to none and would have been designed for a major team. I have discovered an interesting photo that shows three of these jerseys being worn in a Nelson B.C. High School Hockey Team photo circa the late 1920’s. 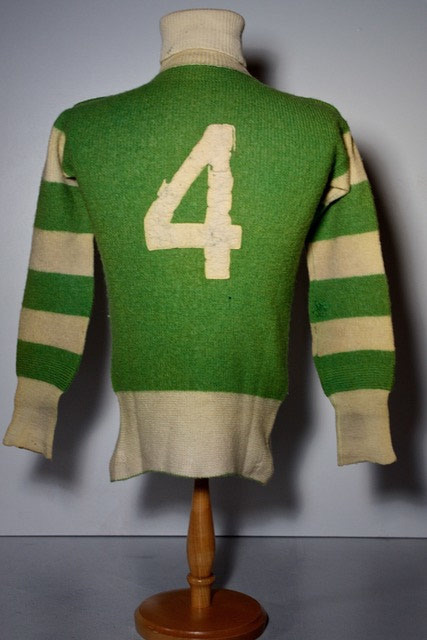 The players are shown wearing five different styles of jersey which would suggest that they were wearing what ever was available as long as the jersey was green and white, which is consistent with jerseys worn by major Nelson B.C. teams of the era. A white felt # 4 adorns the back.